Use your voice and imagination to help kids in need! 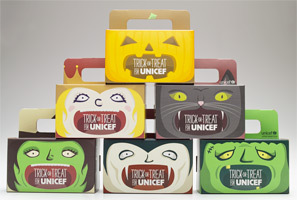 Order your Trick-or-Treat for UNICEF boxes today! Collect donations for UNICEF in your box by going trick-or-treating or by raising funds in your own unique way. The money you raise will help UNICEF provide clean water, nutrition, education and more to millions of kids in need around the world. This fall we’re introducing a brand new cast of characters to be featured on Trick-or-Treat for UNICEF collection boxes. Meet Frank, Count Change-ula, Lady Pennyworth, Bertha DeBroom, Shadow, and Patches! One winner from each age category (children 4–8 years , 9–12 years, 13 years and older) will be chosen and announced on Halloween, Oct. 31. Order your fundraising kits while supplies last. The contest will run from September 1 through October 26. Remember, cool characters will inspire donations — and help more of the world's kids. What will you dream up? Superhero or villain? Alien or astronaut? Skate punk or singer? Or something no one has ever thought up before? Be yourself. It’s totally up to you! Coming soon! 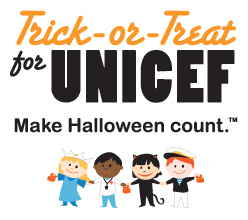 Have great ideas about Trick-or-Treat for UNICEF? Create your own fundraising webpage and share on Facebook or Twitter or email friends and family to make donations and get the ball rolling! Now you can be a leader with your smart phone and help change the world in the blink of an eye! Text the word “TOT” to UNICEF (864233) to make a $10.00 donation to Trick-or-Treat for UNICEF *. * A one-time donation of $10.00 will be added to your mobile phone bill or deducted from your prepaid balance. All donations must be authorized by the account holder. All charges are billed by and payable to your mobile service provider. Service is available on most carriers. Donations are collected for the benefit of the “U.S. FUND FOR UNICEF” by the Mobile Giving Foundation and subject to the terms found at www.hmgf.org/t. Messaging & Data Rates May Apply. You can unsubscribe at any time by texting STOP to short code “864233”; text HELP to “864233” for help.